Ice cream is very popular, due to its refreshing texture and versatility of flavors. Itis perfect for a dessert, as a snack, or to accompany other tasty foods, such as chocolate brownies, or cookies. As ice cream is often made with cream and milk, it naturally has a high fat content. This can be avoided by substituting the cow’s milk with a healthier alternative, such as almond milk. The final product will be just as tasty, and far more healthier. Read on to discover the perfect almond milk ice cream recipesthat you can try at home. This almond milk ice cream is suitable for vegans. 1. Place the coconut milk, sweetener, and vanilla bean (which should have been soaked overnight) into a blender and blend until a smooth puree forms. 2. Add the almond milk and vanilla extract. Here is also where you add the thickening agent, gelatin in this instance, although this is optional. Once you’ve place the almond milk, vanilla extract, and thickener (if using) into the blender, mix it until it’s of a smooth consistency. 3. Cover, and place the mixture into the refrigerator to chill, for about an hour (until cold). 4. Pour the mixture into an ice cream machine and allow it to churn as per the manufacturer’s instructions. 5. Eat, serve, or freeze. This almond milk ice cream recipe is also suitable for vegans. 1. Put almond milk and French vanilla creamer into a medium sized saucepan and whisk in the sweetener. 2. Slice the vanilla bean in half to extract the seeds from inside. Place the seeds and the pod into the saucepan. 3. Place the mixture on a medium heat and allow it to simmer for five minutes. 4. Remove the pan from the heat, and extract around 1/4 cup from the pan. Mix this with the cornstarch (or arrowroot) in a small bowl. Then mix that back into the pan, and whisk it to infuse. Cover, and allow the mixture to sit for twenty minutes. 5. Cool the mixture until cold. 6. Churn mixture in an ice cream maker, as per the manufacturer’s instructions. 7. Serve, eat, or freeze. 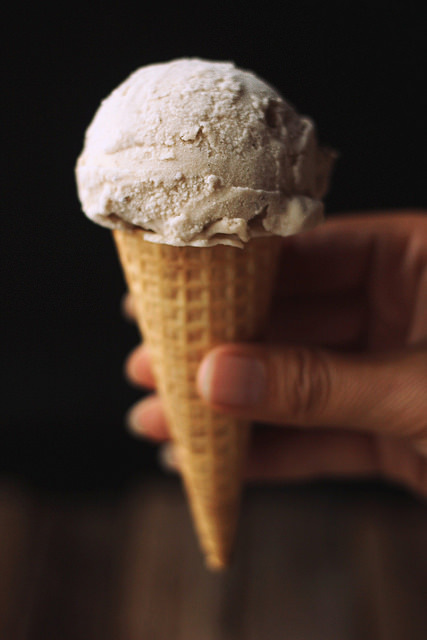 Here’s another almond milk ice cream recipe and clear step-by-step instruction. You just need to substitute the rice milk with almond milk. 1. Soak at least one cup of almonds for up to two days (or at least overnight). The longer the almonds are soaked, the creamier the final product will be. 2. Rinse the almonds once they have soaked for a sufficient period of time. Then, combine them with two cups of water in a food blender/processor, and allow it to run on its top speed for two-four minutes (or until a milky white color is apparent). 3. Remove the mixture from the blender and strain the fluid from the solids by pouring it into a bowl lined with a nut milk bag or cheese cloth. 4. Gently squeeze the bag to strain all of the liquid, known as almond milk. Does Saw Palmetto Work for Hair Loss?